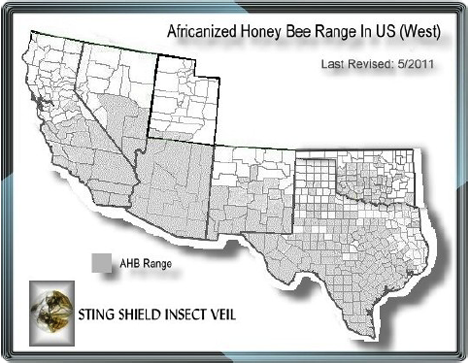 The Africanized Honey Bee (AHB) entered the USA in 1990 and has spread over the Southwest: Texas, New Mexico, Arizona, Southern Nevada, California, Oklahoma, Alabama, Florida, and Louisiana. View Map. The AHB has had some impact on beekeeping in the USA. Many hobbyists have stopped keeping bees in their backyards because of their own choice or changes in local laws. Commercial beekeepers have started management techniques to keep out the AHB or have learned to work with the AHB – or have simply got out of the business. How far north will the AHB go? Many say the AHB will be stopped by cold weather as they move northward. At this point it is hard to say how far north they will move but one fact to keep in mind is that they have survived the long cold winters of Northern Arizona, Southern Utah, and Oklahoma. Tests have proven that the AHB can survive any winter the European Honey Bee (EHB) can survive as long as they have food (Honey) stores to live off of. Countless lives have been impacted by the AHB already in the US. Hundreds of stinging attacks have occurred since their arrival in the US in 1990. Our friends at Stingshield have kept up on the dates and statistics. The truth is most of our human bee interactions happen without incident. Thousands of AHB swarms and colonies are reported and killed by bee removers each year. The problem comes when untrained removers, i.e. do-it-yourselfers, try the splash and dash method of bee control. The statistics are clear: 50%-60% of the deaths and major stinging attacks (attacks resulting in 15 or more stings) happen to the do-it-yourselfers, most with no training and safety equipment. What do the experts say about doing bee removal yourself?